George Willis says it was an easy decision to sign a Boston United contract extension. 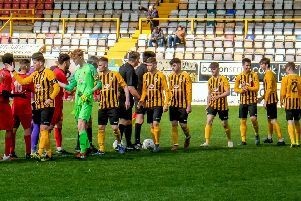 The 23-year-old skipper believes he still has much more to offer the Pilgrims after penning a new deal which will keep him at the Jakemans Stadium until summer 2020. “It was (an easy decision), to be fair,” Willis told The Standard. “I’ve been speaking to Craig (Elliott, manager) a bit more closely this season. The relationship’s growing the longer it goes on, and with me being captain as well means more conversation. “It’s come over the last couple of weeks where we’ve had chats about going forward and what we want to do. Willis and attacker Jay Rollins have already committed themselves to the club next season, and with Elliott currently in discussions with a number of other key players, the goalkeeper is happy that business is getting done early. “Something we’ve spoken about is keeping the core together,” Willis added. “We didn’t really have the chance to do that last year.